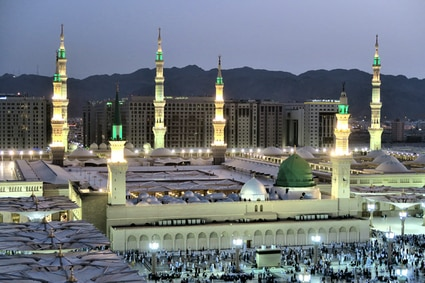 We learn from Sahih Al-Bukhari – the most authentic anthology of Hadith – and other authentic sources, that the Holy Prophetsa would confine himself to the mosque during the last ten days of Ramadan. It is reported that he observed this practice all his life and after his demise, his wives are reported to have continued the same practice. It was from then onwards that the E‘tikaf was, and still is, observed in the last ten days of Ramadan. Hazrat Aishara reports, and we know from Sahih Bukhari, that the Holy Prophetsa would confine himself from the outside world to a specific place during the last ten days of Ramadan, staying day and night in the mosque. He would offer Fajr prayers and then enter the place of his E‘tikaf. For this, Hazrat Aishara reports, she would pitch a tent for the Holy Prophetsa in the mosque. During E‘tikaf, the Holy Prophetsa would only leave his tent to offer prayers in congregation in the mosque or only when he needed to use the lavatory. This shows that he abstained from indulging in any matter of worldly nature and devoted every moment of those days and nights for the remembrance of Allah. The Quran would be reviewed with him in full through Hazrat Gabriel during Ramadan. One year, the Holy Prophetsa observed E‘tikaf for twenty days in Ramadan instead of ten. This was because he had been unable to observe E‘tikaf the previous year. It is said that the Quran was reviewed with him twice in Ramadan when he observed E‘tikaf twice. The mention of not having physical relations with wives during E‘tikaf shows that it is not permissible to indulge in any matter of worldly nature and to solely focus on spiritual progress by way of spending all available time in the remembrance of Allah. It should not be mistaken, as some “ambitious” orientalists would fancy, that E‘tikaf is a period of idleness. So, when time is being spent in the remembrance of Allah, what does that exactly mean? One reads the Quran and understands what their Creator expects of them. One gets to know, through reading Ahadith, what was expected of us by the person who was given the title of Model of Excellence by Allah the Almighty. Reading Tafsir enhances and deepens the understanding of Allah’s message for mankind, thus enabling one to ponder as to how this can be practiced in the modern-day challenges. This leads one to indulge in attaining this understanding through the writings of the Imam of the Age – the Promised Messiahas – and through the sayings of his Khulafa in various times and in the day that we live in. Praying to Allah in an atmosphere where there is no worldly disturbance distracting the Mu‘takif (the one in E‘tikaf), they get the chance to pay gratitude to Allah for His blessings – some of which we tend to not reflect upon by being too busy with worldly matters otherwise. This also means supplicating before Allah the Almighty for ourselves, our families, our colleagues, for all Ahmadis, for the Muslim Ummah and above all, for Hazrat Khalifatul Masihaa. Every organisation does stocktaking at least once a year. They get better results, they get to plan better strategies, they get to know about their profits and also about their losses. They get to know what challenges they face and how to overcome them in the best possible manner. On an individual level, let’s take E‘tikaf as a personal stocktaking. Imagine the benefits!